Step into Van Gogh’s world. Explore the world’s largest collection of works by Vincent van Gogh at the Van Gogh Museum in Amsterdam. Vincent van Gogh (1853–1890) is one of the Netherlands’ most famous artists. Read his biography, discover the stories about his life and work, and explore his paintings and drawings in the museum’s collection. famous paintings like Sunflowers, Almond Blossom, and The Potato Eaters. Vincent van Gogh Foundation in 1962. Together with the State he build the Van Gogh Museum, in which the family collection was placed on permanent loan to make sure that it got managed and preserved for future generations. Vincent wrote alot of letters to his brother Theo, like the one shown below mentioning the famous painting ‘The Potato Eaters’. 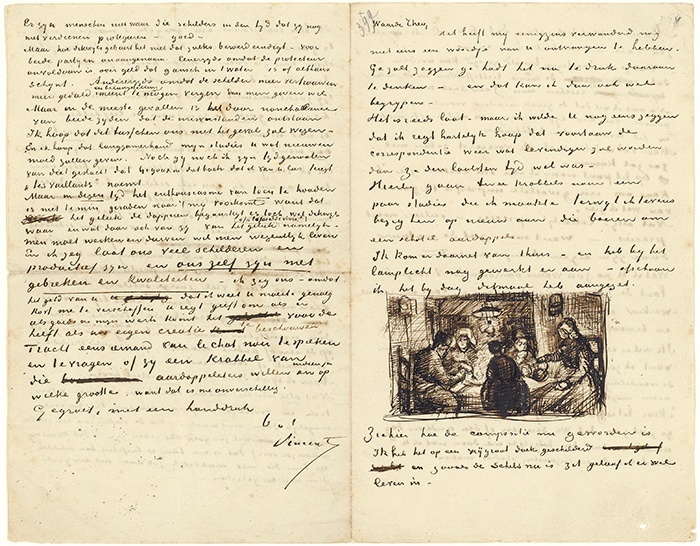 Vincent van Gogh, Letter from Vincent van Gogh to Theo van Gogh with sketch of The Potato Eaters, Nuenen, 9 April 1885, pen and ink on paper, 20.7 x 26.4 cm, Van Gogh Museum, Amsterdam (Vincent van Gogh Foundation) Letter 492. The museum offers an interactive program for visually impaired visitors. Here, visitors can feel, smell and listen to the Sunflowers. € 2,50 discount on EACH Van Gogh Museum ticket in combination with the City Canal Cruise.